Various species of dwarf mistletoe (Arceuthobium spp.) are potential pests of different pines (Pinus spp.) in U.S. Department of Agriculture plant hardiness zones 3 through 9. The mistletoe species as a whole cover a wide area, although individual species of mistletoe and pine hosts generally offer much smaller growing areas. Dwarf mistletoe, the only type of mistletoe that attacks pine trees in the United States, is a parasitic plant capable of seriously impacting the health and appearance of a prized pine. Dwarf mistletoe on a pine tree first appears as a small bump at the point of infection; shoots do not emerge from this area for another couple of years. Shoots of the dwarf mistletoe are leafless and protrude from the swollen areas on the host. Shoot color and size varies between species. These shoots are generally less than 6 to 8 inches long and are segmented and nonwoody. Trees usually respond to a mistletoe infection by producing masses of abnormal growth composed of small twigs and needles known as "witches' brooms." Mistletoe requires a living host to grow. Dwarf mistletoes are dioecious, meaning that plants are either male or female and produce only pollen or berries, respectively. 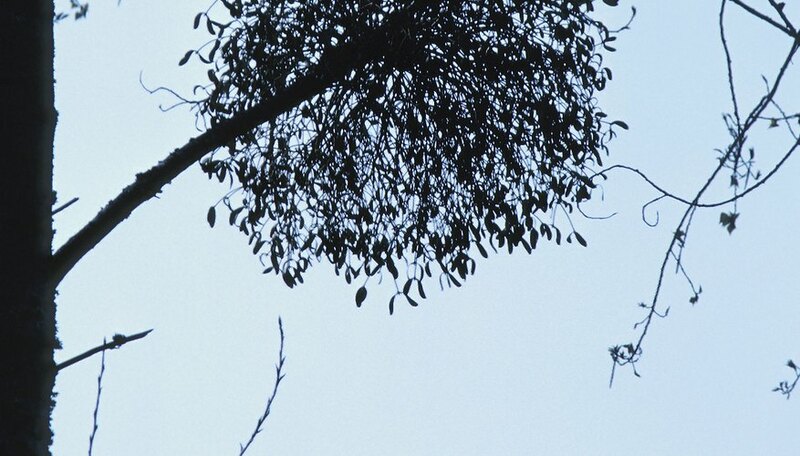 Mature female mistletoes produce fruit that can forcibly discharge sticky seeds over 30 feet horizontally. The dwarf mistletoe seed germinates when moisture is present and produces rootlike structures, haustoria, that grow into and extend throughout the host tree's conducting tissue. Mistletoe shoots then emerge and grow until they reach maturity, about three to six years following infection. Dwarf mistletoe plants gradually reduce a host plant's vigor, forcing the tree to decline from the top down. The witches' brooms take both water and nutrients from the host tree. Healthy, vigorous pine trees may tolerate a light mistletoe infestation, but affected limbs are still weakened or killed. A severe problem will stunt or even kill pine trees, especially if the pine tree is under additional disease, pest, drought or other stress. Because mistletoe requires living tissue to grow, physically removing a mistletoe-infected branch will kill this parasite. Make pruning cuts at least a foot below the point of mistletoe attachment to completely remove the haustoria and remove large branches with a cut next to a branch collar, the area of raised tissue where they meet a larger branch or the main trunk. You may opt to simply cut the mistletoe off of the pine limbs or trunk. While this does not kill the parasite and the mistletoe will grow back, regularly removing the mistletoe shoots can limit seed dispersal. Where pine trees are very bothered by dwarf mistletoe, consider removing and replacing these susceptible trees. Infestations that are up very high in the tree should be taken care of professionally. Chemical treatment of mistletoe is generally only warranted in high-value areas or where there are vulnerable young trees located near infested trees. A spray of ethephon, a growth regulator, can kill the mistletoe shoots that it comes into contact with, although the mistletoe will regrow and require repeat treatments, so it is only suitable for reducing seed production. Ethephon is most effective if applied during the dormant season before new growth emerges on the pine and when the daytime temperature is above 65 degrees Fahrenheit. When spraying, thoroughly cover the mistletoe plant's foliage, and not the entire pine tree. United States Department of Agriculture Natural Resources Conservation Service: Arceuthobium M. Bieb.